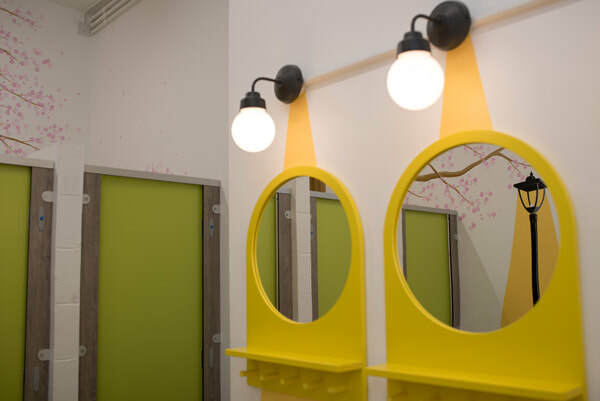 The brief for the Quad toilets at Kent College was “Use your magic to make them look good!”. 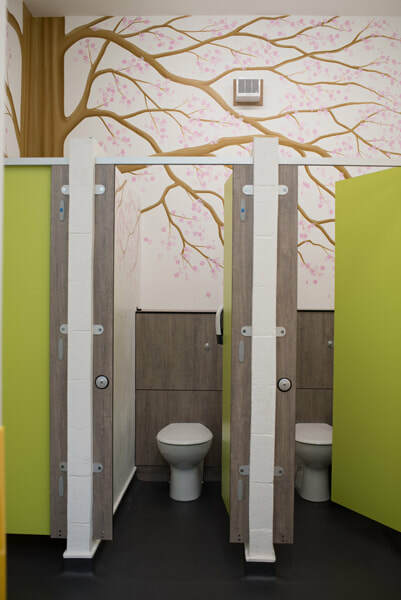 A toilet block may not be the most glamorous of assignments but a great project to tackle with such an open design brief! 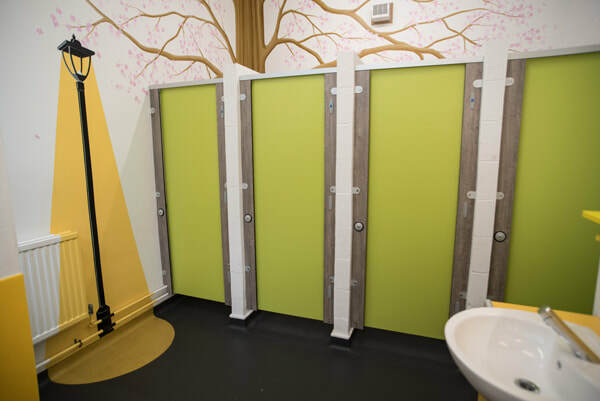 Positioned at the centre of the school - nearest to the dining hall and between classes - the toilet blocks get a lot of use during the school day and were in serious need of refurbishment. 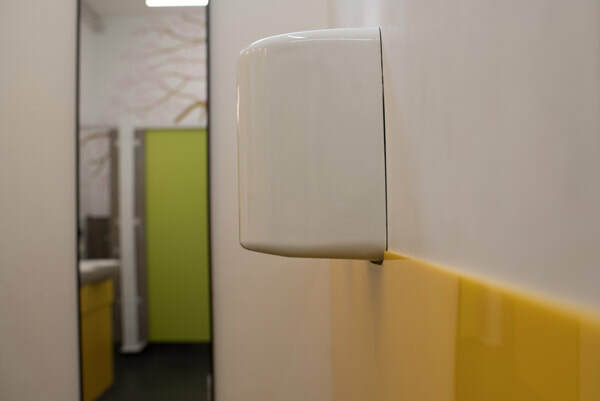 The design needed to be functional - to withstand heavy use and stand the test of time (and students) as well as be easy to maintain and clean. 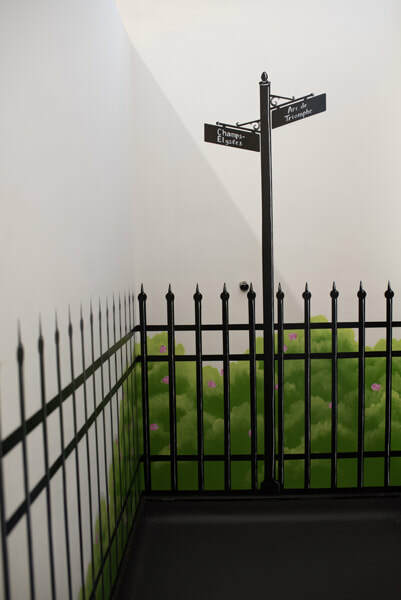 I also wanted the spaces to be pleasant to be in - and not a space that pupils dreaded going in to - which was the case before. For the girls I wanted a feminine feel without it being overly girly - and settled on a Paris Street scene. 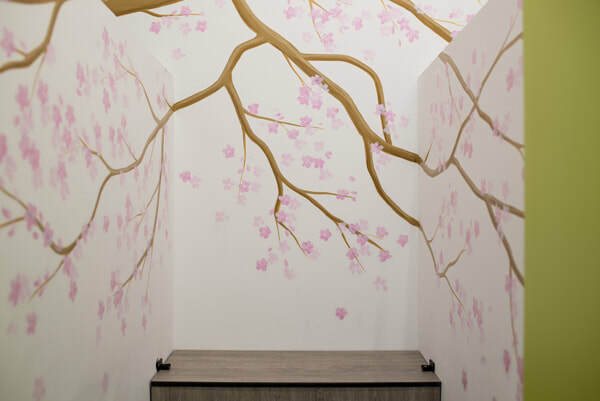 A cherry blossom tree dominates the scheme and I commissioned a mural artist - Marvellous Murals – to interpret my design. 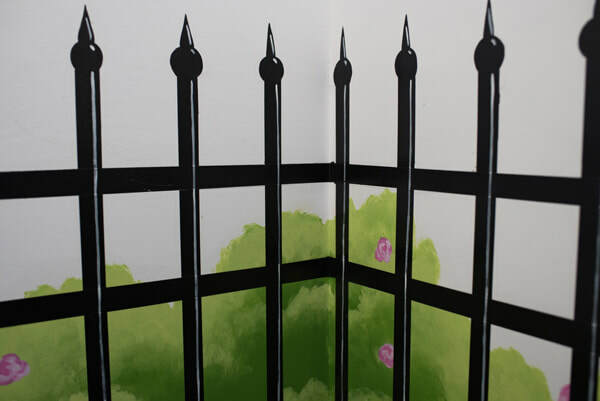 As well as the tree, they brought my sketches of the scheme to life with painted metal railings, shrubs and a street light. 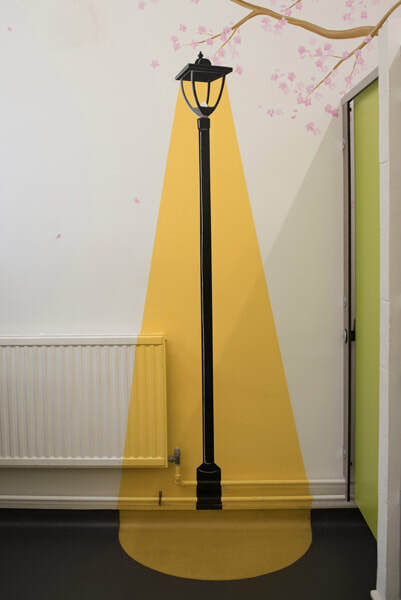 The beam of lamp light continues in a yellow pool of light on the floor within the black flooring - which is a dark colour both to hide as many scuffs as possible and to be reminiscent of a tarmac street. 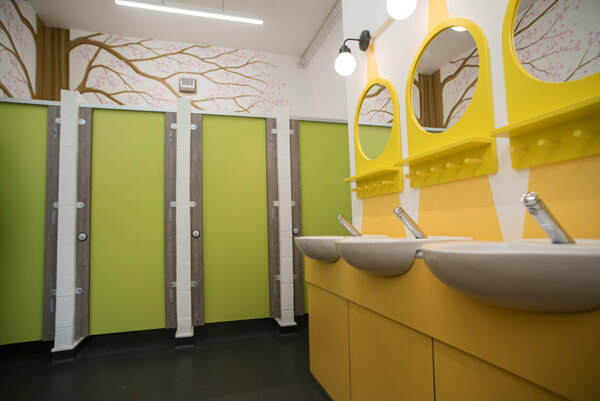 I used bright yellow for the basins and green for the toilet doors for a happy, energised feel – and wood effect panelling to the rest of the cubicle area to continue the theme. 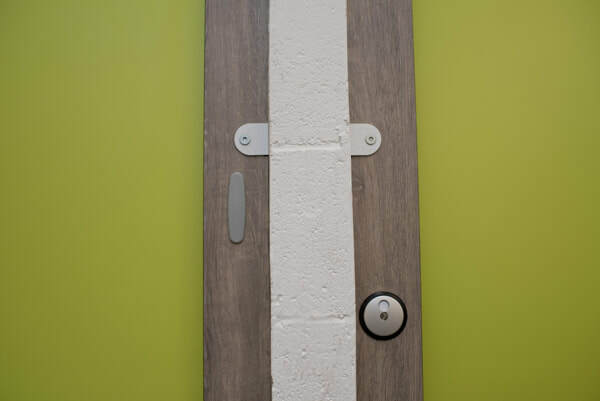 I also allowed for hooks on the doors and a shelf at the back of the toilets so that girls could take books, bags & coats into the cubicles without having to place items on the floor. 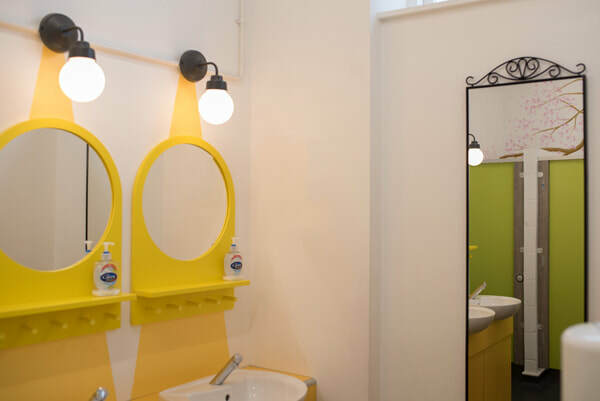 Each of the basins has a mirror and small shelf – as well as a light. 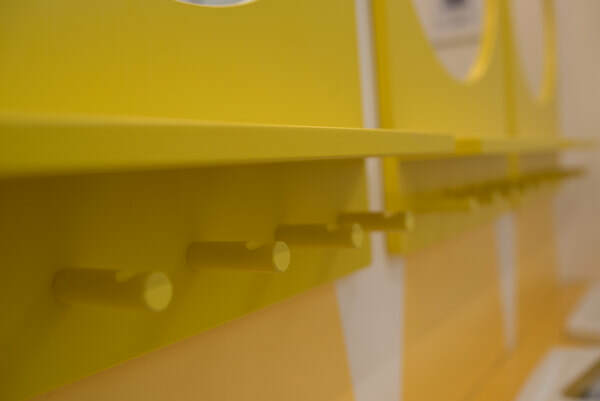 This design was great fun and is the perfect example of being aesthetically pleasing, with plenty of design features, and extremely functional!